LATEST UPDATE: 14th April 2019 – Corrections have been made to the Angus & Robserton History page, as well as individual Gallery entries, beginning with Night of The Werewolf. Welcome to Hardy Boys .co.uk – an unofficial guide to the British and Commonwealth series for enthusiasts and collectors. The Hardy Boys were created by Edward Stratemeyer in 1927 for his Stratemeyer Syndicate publishing empire. For many years, Grosset & Dunlap was the American publisher who owned the sole rights to publish this and many other Stratemeyer Syndicate series. During the 1940s, the US Hardy Boys editions were exported to several overseas markets, such as Australia, New Zealand and Britain, but by the end of that decade there was interest in publishing separate editions in the UK especially for the Commonwealth market. In 1950, 23 years after the publication of The Tower Treasure in the United States, the very first Hardy Boys title to be released in Britain was issued by Harold Hill – The Secret of the Lost Tunnel. And so began the British series, which saw Anglicised text versions of the stories distributed all around the world, but principally to Commonwealth nations, including Australia, New Zealand, India, and parts of Africa (Canada for the most part was served by the US editions). The Republic of Ireland is also known to have imported British editions for many years. Therefore, it would be no exaggeration to claim that outside of North America, the books printed and published in Great Britain were of fundamental importance in promulgating the stories of Franklin W. Dixon to English-reading audiences all around the globe. In this context, it is our express aim to document and describe the many British publishers that have handled the Hardy Boys since 1950; detailing their often very different approaches to the packaging and presentation of the stories. Sadly, it appears that the era of genuine British releases came to a somewhat inauspicious end in 2006, so the story we have to tell spans a finite length of 56 years. History The publication history of the Hardy Boys in Great Britain and the Commonwealth. A detailed written account of the period spanning 1950 through to 2006, with emphasis on the publishers, book formats and artist bibliographies. 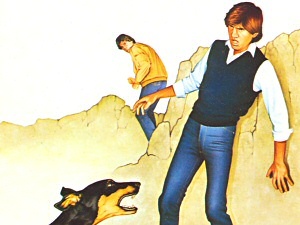 Gallery A pictorial guide to the 520 British Hardy Boys editions and cover formats. Arranged by series and by title, the covers are supplemented with detailed publication data, such as release dates, ISBNs and cover and internal artists. Peter J. Archer (1933 - 2018).